This phone is a French model with a two pin mains plug and a French voice prompt. The Gigaset S445 is the phone for lovers of efficient technology. One look at it tells you this is the solution to all your communication needs. 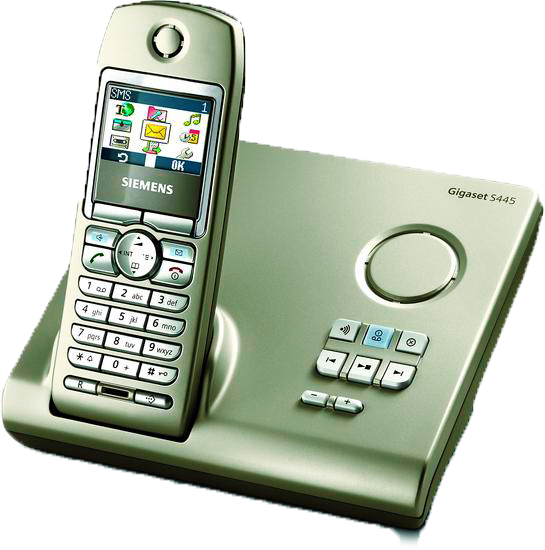 The Gigaset S445 unites voice dialling with superior sound quality and enhanced hands-free talking. Really handy is its voice-announced caller-ID: you will immediately hear who is calling as long as your caller’s name and number are stored in the phone directory of the Gigaset S445. The same is true for the messages on the integrated answering machine. People who work a lot on the phone will appreciate it. The Gigaset S445 helps manage your daily life with an advanced data exchange function for the phonebook. It features SMS with up to 640 characters and is VoIP ready. Just connect the Gigaset M34 USB to your computer. It will pass the VoIP signals from the Internet to your Gigaset S445 base-station, this way providing you with comfortable cordless Internet telephony via your Gigaset S44 handset.